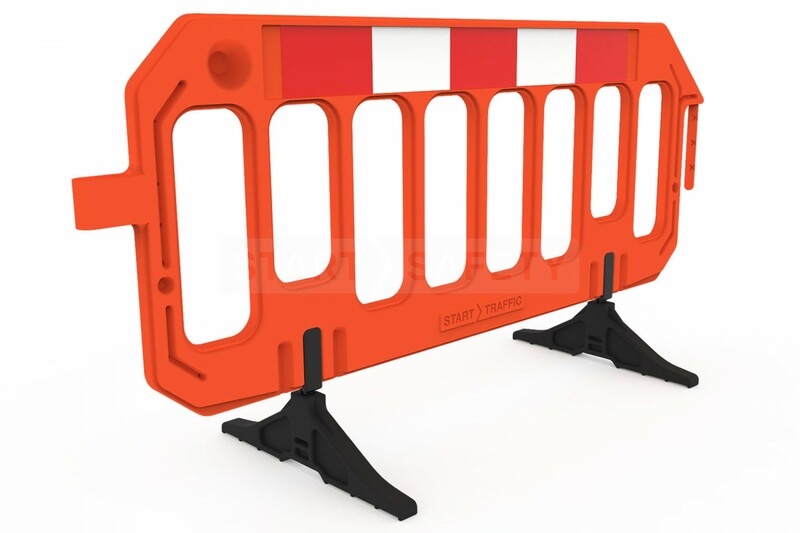 This plastic safety barrier is ideal for use around construction sites, event venues or anywhere pedestrian safety and or direction is required. It has a simple interlocking design that prevents unauthorized pedestrian access to restricted areas, improving site safety. The Gate Barrier has a multitude of uses outside the conventional construction site environment. Gate Barriers are widely used for agricultural projects, private clubs, leisure venues and all manner of public events. As the Gate barricade only weighs 22 lbs. it can easily be deployed by a single person. Each barrier measures 6.5ft long, making deployment of long spans of barricades fast and easy. 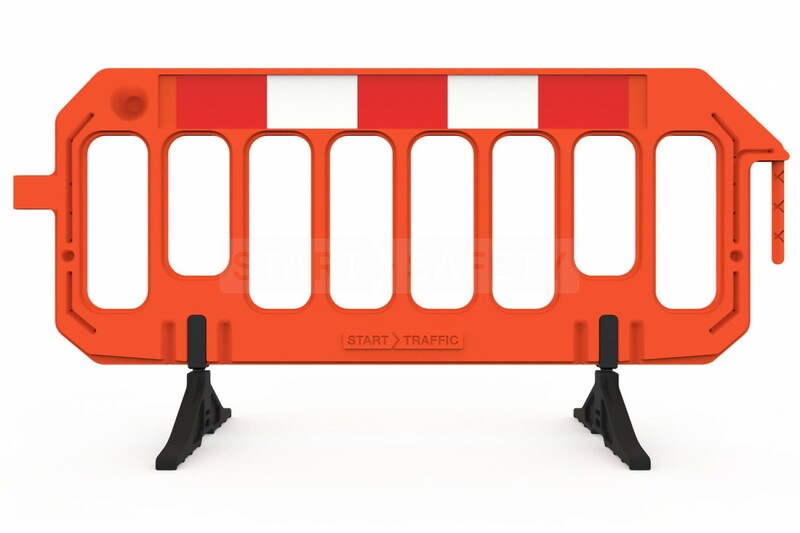 The speed that these barriers can be deployed makes them ideal for site works in busy pedestrian areas where barricades need to be deployed quickly and safely and can be dismantled in the same quick safe fashion. 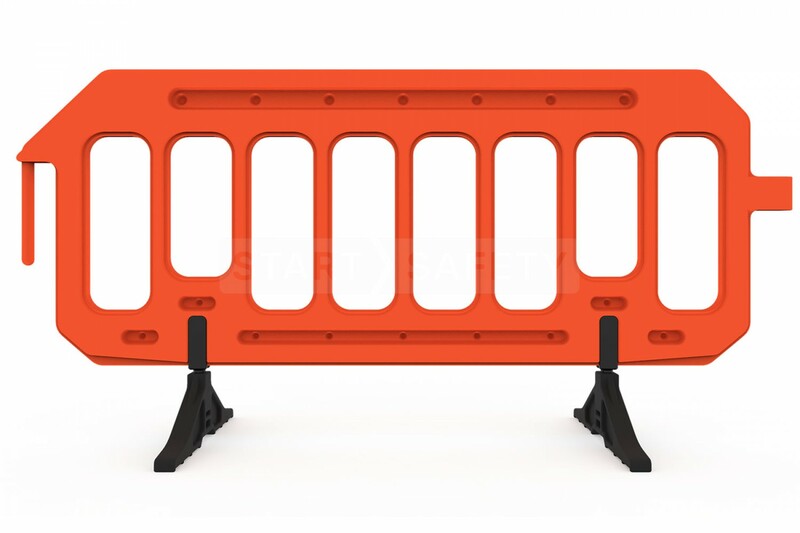 Each barrier features a two-stage locking system, this means that the barricades can be connected loosely or in a “locked” position without the need for any additional clips or fastenings. When locked in place it discourages unauthorized dis-assembly of the barricade, ensuring that the barricade is not tampered with, and pedestrians are kept out of harms way. Each unit has mounting points for branding to be attached, allowing you to display your company's brand, as well as safety information to passing traffic. If you are looking for bulk quantities we are able to supply the barricade units in custom colors (minimum order quantities apply). The Gate Barrier is made from UV stabilized HDPE plastic that is blow molded, this blow molded construction not only gives the Gate its lightweight, but makes it very resistant to damages. The Gate Barrier was run over repeatedly with construction equipment during testing, and was still in usable condition afterwards. Stacks in 2 inch layers with location indents (40 per pallet). Doubles as crowd control barrier. Two moulded lamp connectors - one in line and one at 90°. Barrier to barrier connection is quick and easy to use - allows angular movement in plan and elevation. Manufactured in High Density Polyethylene. Per Pallet ~ 880 lbs. Yes, This barrier comes with standard feet. If you require spare feet these can be purchased separately.